Galen and Lynn Neal are pictured on their wedding day on June 30, 1965. 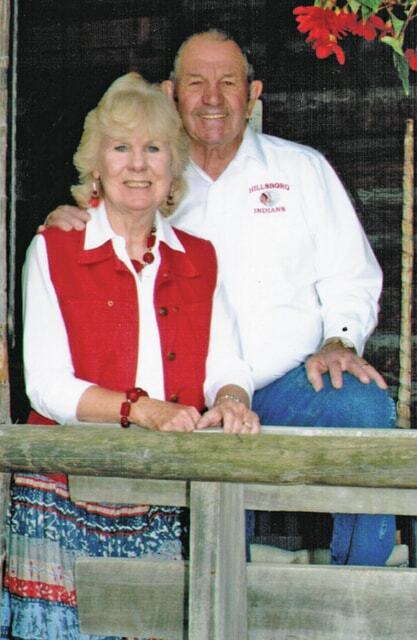 Galen and Lynn Neal are pictured in a more recent photograph. Galen and Lynn Neal would like to invite family and friends to join them in celebrating their 50th wedding anniversary. Galen and the former Lynn Hamilton were married on June 30, 1965 at the Belfast Presbyterian Church. Lynn is a graduate of Belfast High School and Galen graduated from Sinking Spring High School. They both retired from the Hillsboro City Schools with 63 years of combined service. Lynn worked as the secretary for the school superintendent for 32 years and Galen worked at Hills & Dales School and retired from the Hillsboro City Schools as an outdoor maintenance man. They remain active in the community, volunteering time to the Highland County Historical Society, Highland County Senior Citizens Center, Danville Church of Christ and the Hillsboro City Schools, where they are avid supporters of the Hillsboro Indians athletic programs. This year will be Galen’s 50th year of keeping the scorebook for the boys’ basketball teams. They enjoy driving their horses with the Harness and Hitch Driving Group, camping, traveling and attending HHS events. Please join them in their celebration on Saturday, June 27, 2015 at the Highland County Senior Citizens Center, 185 Muntz St., Hillsboro. The party will start at 4:30 p.m. with refreshments, and at approximately 7:30 p.m. the George Brothers Band will play for square and round dancing. Dress is casual and please, no gifts. The gift of your friendship is the most precious gift of all.